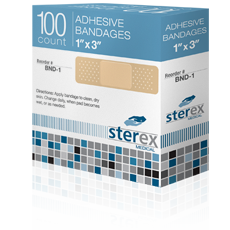 Sterex Sheer Band-Aids are made of a hypoallergenic sheer plastic material and offer breathable protection. The long-lasting adhesive adheres to any skin type, even when wet without sticking to the wound. 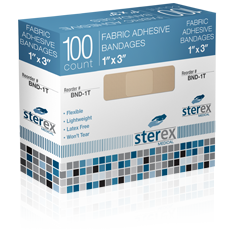 Sterex Fabric Band-Aids are haemostatic adhesive bandages that are made with Tricot fabric to provide superior flexibility and. They are designed to be non-irritating & comfortable on the skin while protecting wounds from infection, debris, and germs.